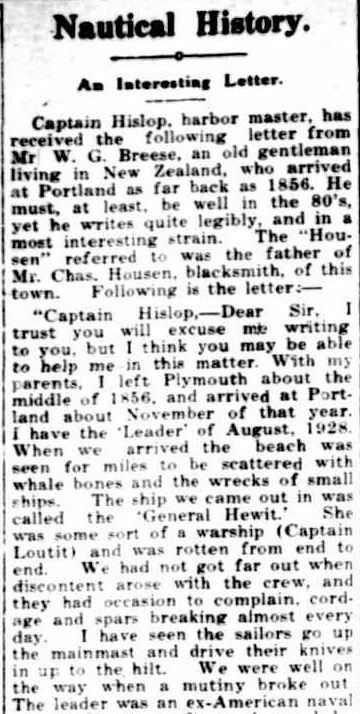 When I read pioneers’ obituaries, a ship comes up time and again, the General Hewitt. 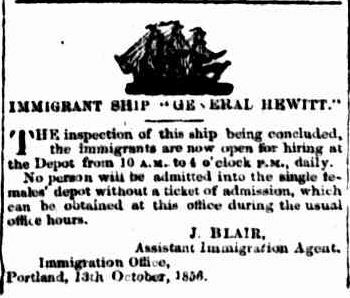 The ship, also called the General Hewett, was a convict ship and later an immigrant ship, sailing to Moreton Bay in 1854 . The voyage I will focus on was to Portland Bay in 1856. And what a voyage it was. The General Hewitt also carried much needed supplies from the home country, whiskey, brandy, gin and champagne. There was also some practical cargo such as clothing and haberdashery, garden seeds and glassware. 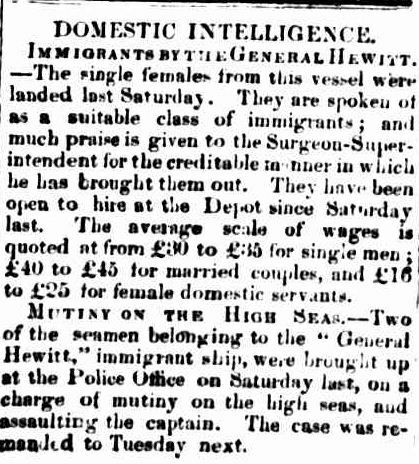 The single females from the ship were available to hire from £15 to £26 for a domestic. Married couples could be employed at a rate of £40-£45. 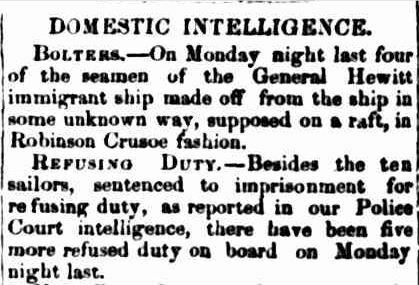 While most of the immigrants were “suitable” there were some crew members that were not, resulting in an eventful voyage, with a mutiny attempt no less. The drama did not stop once the ship arrived at Portland Bay. Four crew members left the ship on a raft. 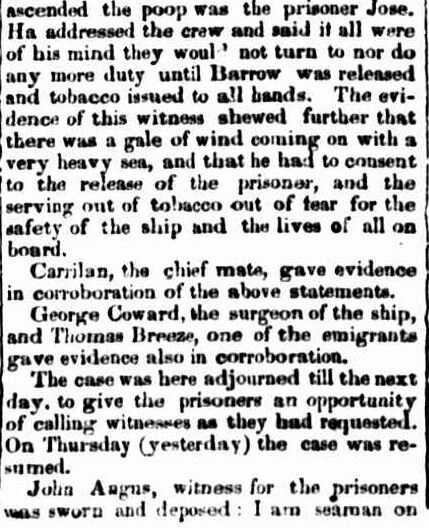 Ten others had been locked up and five on the ship were refusing to work. 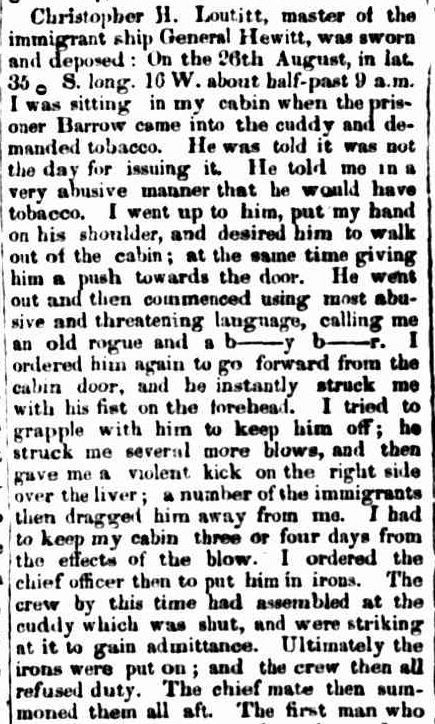 On October 14, the two men accused of assault, William Jose and Joseph Barrow appeared in the Portland Police Court, as did the 10 men refusing duty. Their names included Able Seamen Millard, Gash, Parry, Gudridge, Gashar and Howson the sail maker. 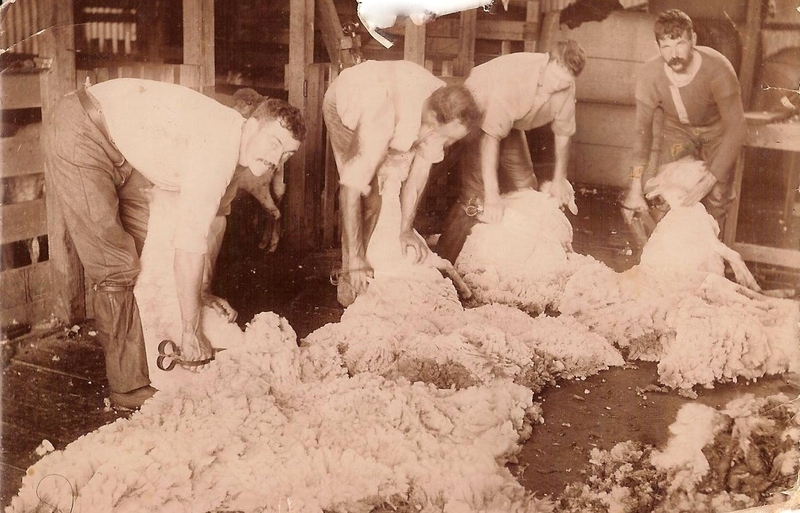 They received four months hard labour. The General Hewitt’s arrival was kept the Police Court busy. 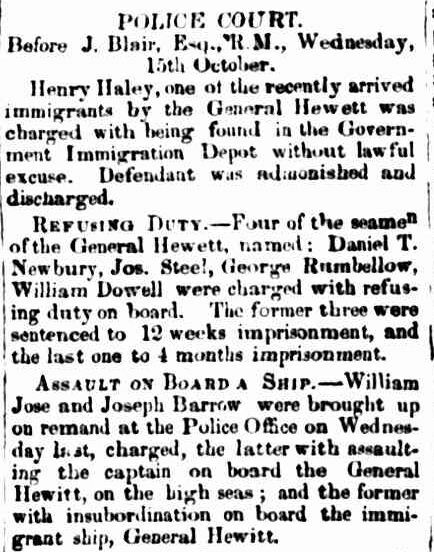 On October 15, one of the immigrants, Henry Haley appeared for being found in the Government Immigration Depot without permission. Four more crewmen appeared for refusing duty, Daniel Newbury, Joseph Steel, George Rumbellow and William Dowell. Their sentences ranged from 12 weeks to four months imprisonment. 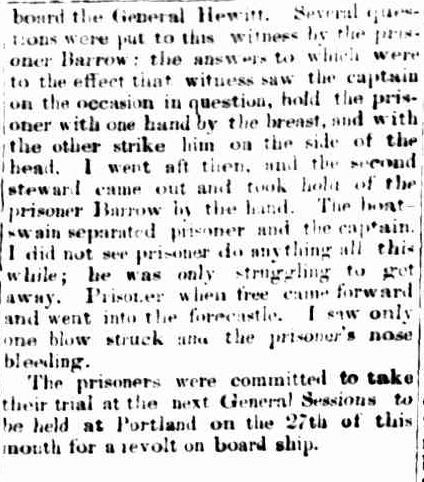 The trial of William Jose and Joseph Barrow for the assault on Captain Christopher H. Loutitt continued. The General Hewitt was already low on crew when, on November 7, two more absconded, the steward, William Thomas an John Carroll the cook. They had the diggings in their sights, but instead they ended up digging roads. A Police Constable kept watch on board the General Hewitt to prevent any more crew jumping ship. 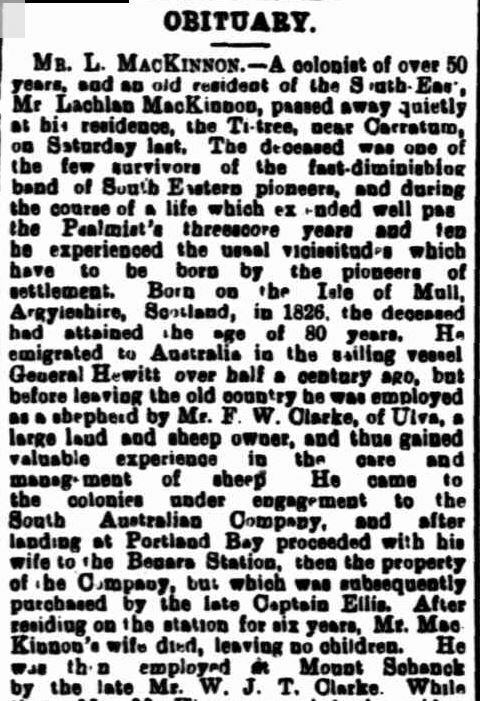 Captain Loutitt travelled to Melbourne in search of more crew. 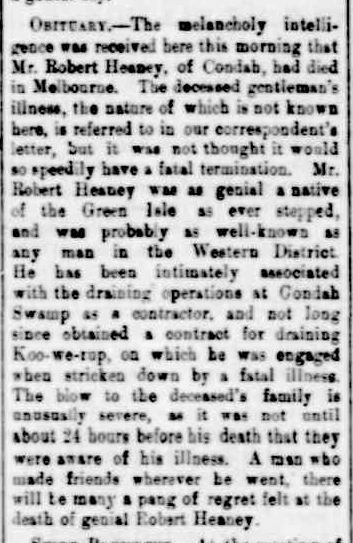 Sixty-two years after the arrival of the General Hewitt, the death of John. S Andrew aka John Forster, brought to light more about the crew of the General Hewitt. 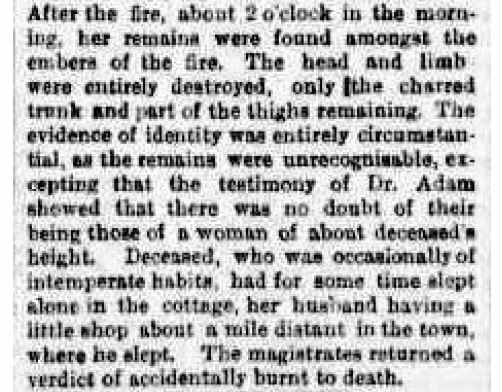 John Andrew was a crew member that bolted, ending up at Muntham near Casterton, where he remained for the rest of his life. 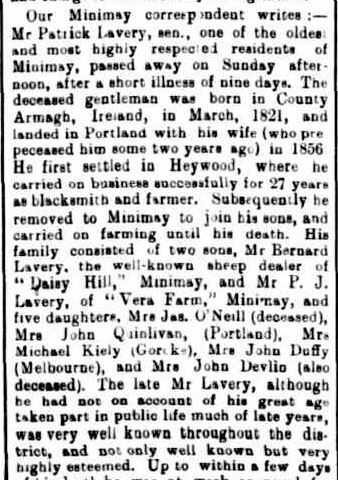 According to John’s obituary, other men of the district that were members of the crew included Messers Rooking and Gasperino. Now to the passengers. As I’m currently tied to home, I didn’t think I could get access to the General Hewitt’s passenger list, so I thought I would find some of the passengers using Trove and a bit of Googling followed by a cross check with the PROV Online Shipping records. While I did not come close to the “363 souls” on board, I did find around 70. Some of those continued to live in the Western District or just across the border in the South East of South Australia. 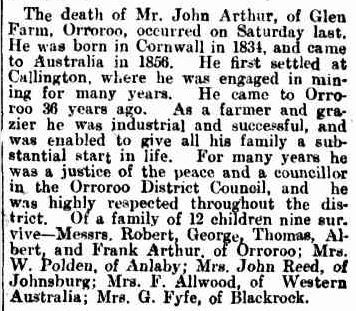 Then, a need to double cross check and a feeling of guilt about omitting the other 290 or so passengers, I thought I would give Ancestry.com.au a go. 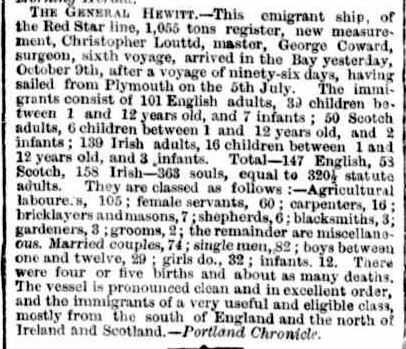 Using the Victoria, Australia, Assisted and Unassisted Passenger Lists 1839-1923, I searched with General Hewitt in the Keywords field and the year 1856 and the list came up. Early excitement faded rapidly when I realised the work another 290 names were going to bring and the transcribing of the passenger list was far from perfect. The Cameron family had become the Cameau family, to name just one discrepancy. 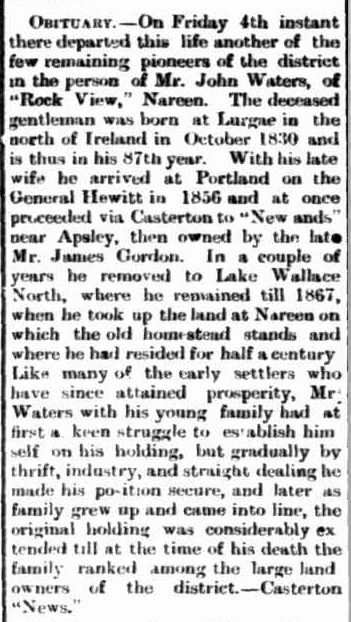 As I’ve pottered away on this post for a few weeks, I have decided to just feature those passengers that had their voyage on the General Hewitt mentioned in their obituaries, plus a couple of others I found on the Glenelg and Wannon Settlers site. Maybe, one day when I am stuck for something to do, I may start working my way through the other “souls” and share them with you. John was 20 at the time of his arrival at Portland. 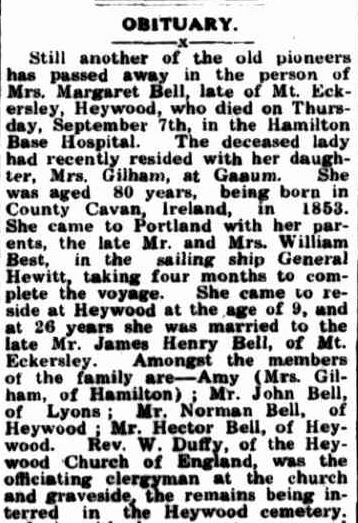 Margaret Best married James Bell a member of another of Heywood’s pioneering families. Letitia Best married Donald Rankin. 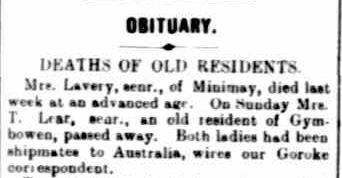 After her marriage, she lived in Harrow, Western Australia and Heywood. 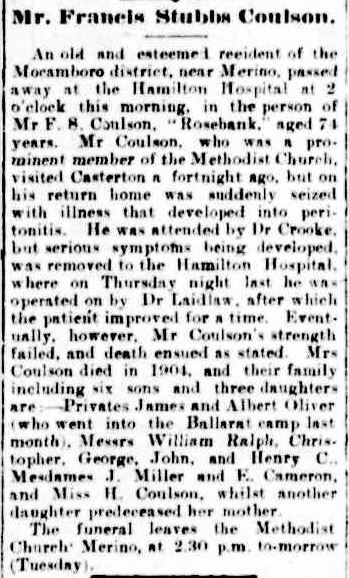 The obituary of Christopher Coulson Snr. The letter is from William G. Breese, son of Thomas and Ann. William was just seven when he arrived at Portland Bay, but 73 years later he was able to recount the voyage particularly the attempted mutiny. 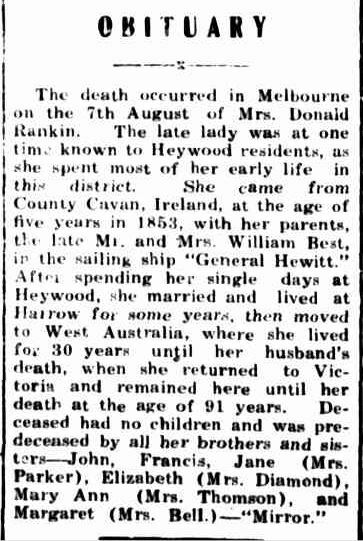 DWYER, EDMOND – I am yet to find the fate of the General Hewitt, however, Edmond Dwyer’s obituary states the ship was destroyed by fire after one more trip to Australia. 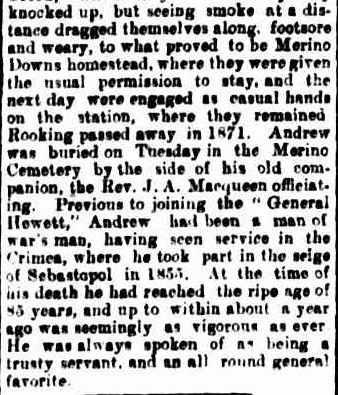 The General Hewitt did make one other trip to Australia landing at Port Adelaide in 1858. 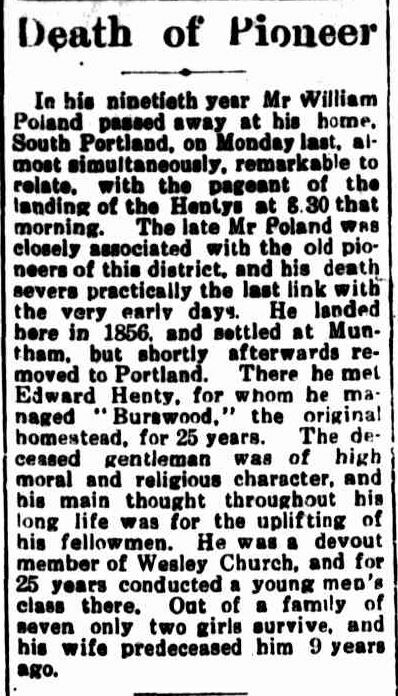 Edmond’s obituary is also useful in that it mentions other passengers on the ship – the Heaneys and Messers Roulston and Waters. 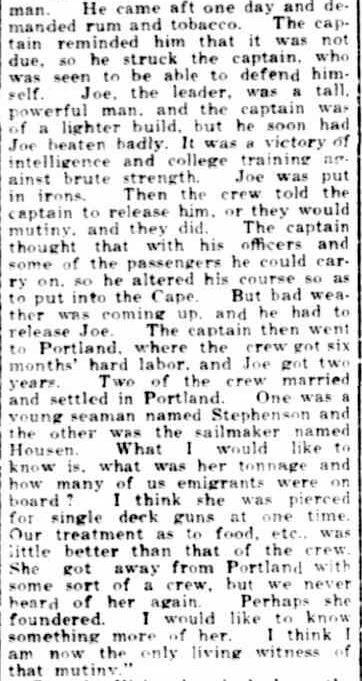 I can find each of these passengers but I cannot find a passenger under the name of Cannon he mentions. 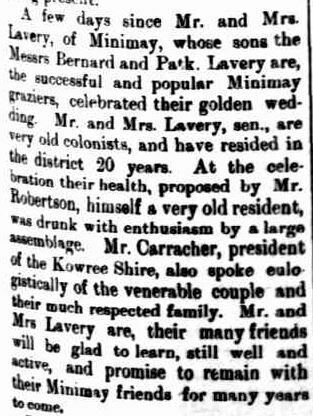 Patrick and Rose celebrated their Golden Wedding Anniversary in 1900. Rose Lavery passed away only days before her fellow General Hewitt shipmate, Mary Lear (below). 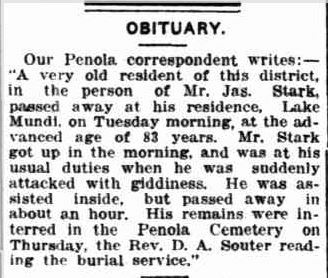 There was a “take two” with Thomas Lear’s obituary. 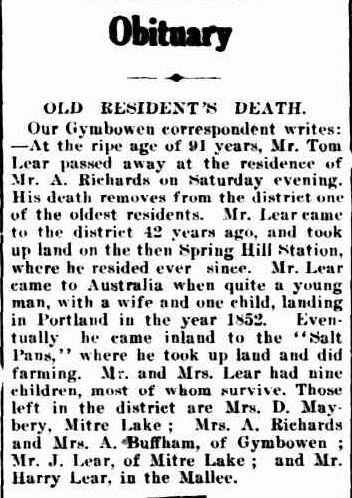 The Gymbowen correspondent wrote an obituary published in the Horsham Times on February 18, 1919. The issue of February 21, 1919 set a few facts straight. Alexander passed away only six months after his mother. The McFarlanes also offer a lesson: Even though a person/s disembarked in a particular port, it does not mean they stayed in that general area or even that state. 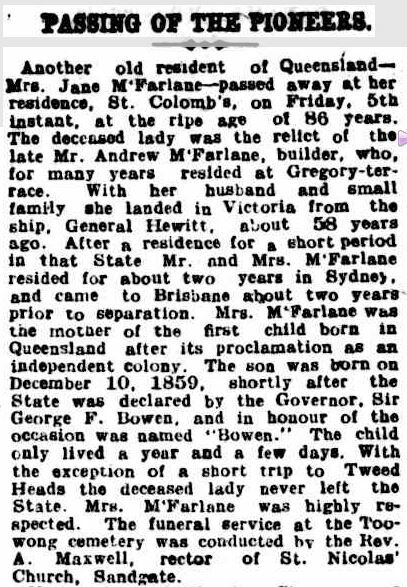 The McFarlane’s made it from Victoria to Queensland after only two years in the Australia. 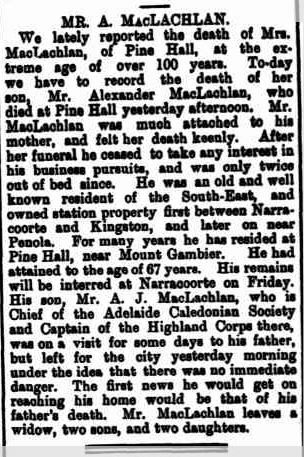 MACKINNON, Lachlan: Lachlan MacKinnon, originally from Argyllshire, Scotland, arrived with his wife and frankly, proving he was on the General Hewitt has almost done my head in. He does not come up in a search on the PROV Index, in fact no MacKinnons do. There are McKinnons that sailed on the General Hewitt, but no Lachlans. 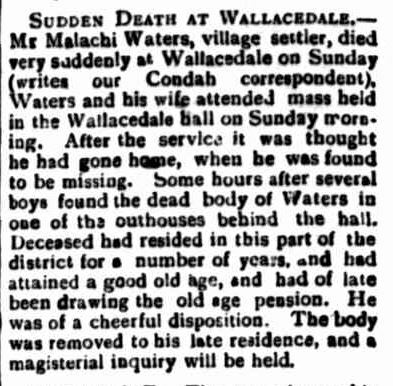 Looking to the Ancestry.com.au index, there was a Lachlan McKenzie and several other McKenzies with christian names the same as the McKinnons found on the PROV Index. 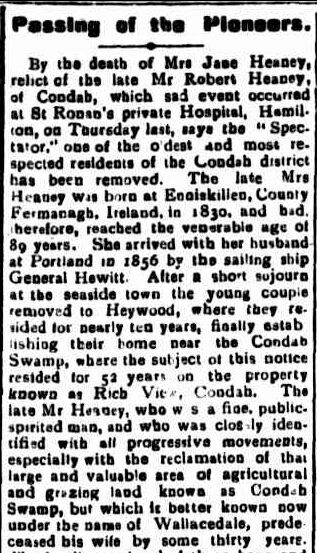 The PROV Index has no McKenzies arriving in 1856. 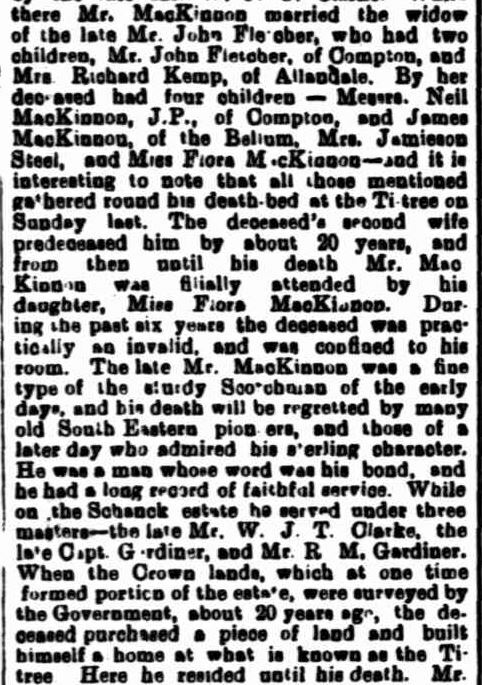 Given the aforementioned dependencies at Ancestry, do I assume the McKenzies are McKinnons and the Lachlan McKinnon listed is really Lachlan MacKinnon? 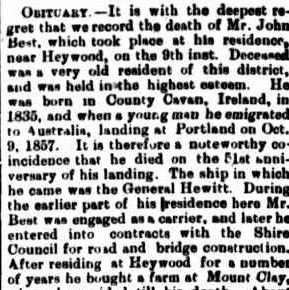 If one of your family members sailed on the 1856 voyage to Portland Bay on the General Hewitt, please let me know in the comments.